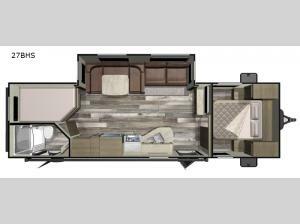 A convenient feature of this Starcraft Mossy Oak 27BHS travel trailer is the double door entry. One entry leads directly into the bathroom which makes for convenient access from the outdoors while the other one enters into the living space. By having a U-shaped dinette and a sofa slide out, it saves you space during the day and provides extra sleeping areas at night. With the double bunk beds being located in the rear, it will help separate you from the noise of your kiddos. Inside the front private bedroom, you will enjoy a good night's rest on the queen bed with nightstands and closets on either side to help keep things neat and tidy!